Tarps Plus Blog: Do you Have a High Quality Gym Cover? For Schools and many other places that in house gyms having a Gym Floor Cover is very important. Repairing a Gym Floor can be very costly and protecting it is a must. 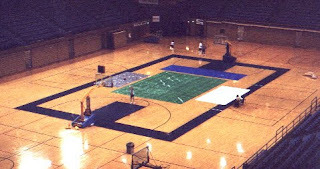 Tarps Plus has many Gym Floor Covers in high quality poly tarp. The selection of these Gym Floor Covers is huge and you are guaranteed to find the Gym Floor Cover that best fits your needs. The high quality Gym Floor Covers have many specifications and features that make it a great tarp such as Waterproof, Mildew Resistant, Acid Resistant, Tear Resistant, and many other features that make this Gym Floor Cover such a great cover and not to mention an extremely low price. Take a look at the great selection of Gym Floor Covers at www.TarpsPlus.com. Olive Vista Middle School wants to Thank Tarps Plus for the amazing deals we got on the Gym floor Covers. Great Quality Products. We learned the consequences of not using a gym floor cover. We ordered 3 gym floor covers for a great discount!! Great Quality! !